Available in paperback from Amazon online bookstore. Available in PDF ebook and paperback from Lulu online bookstore. "The official government conspiracy theory is that on the morning of September 11, 2001, 19 Arabs nearly simultaneously hijacked four planes using box cutters and purposely crashed one plane into the Pentagon, crashed two others into each of the World Trade Center Twin Towers, and the fourth plane crashed in Shankesville, Pennsylvania as a result of the passengers rising up and trying to get control of the plane from the hijackers. This book will prove beyond any reasonable doubt that the government’s conspiracy theory is a preposterous cover story. 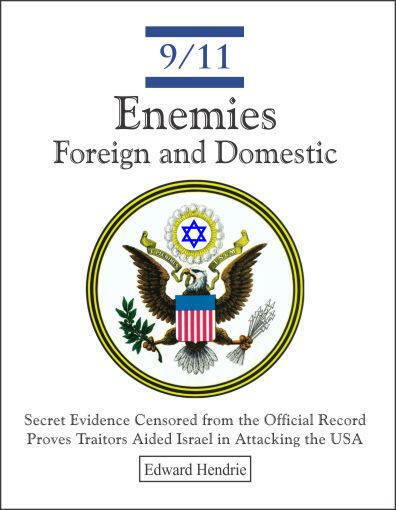 The truth is that the attacks on 9-11 were perpetrated by Israel, aided and abetted by high officials in the U.S. Government." 7 What Happened to UA Flight 93? 15 What Did Bush Know and When Did He Know It? They need torture as a tool to produce confessed patsies for future false flag operations. Torture serves their depraved need to persuade innocent people to confess to crimes they did not commit and convince those patsies to accuse other innocent patsies of being their co-conspirators.